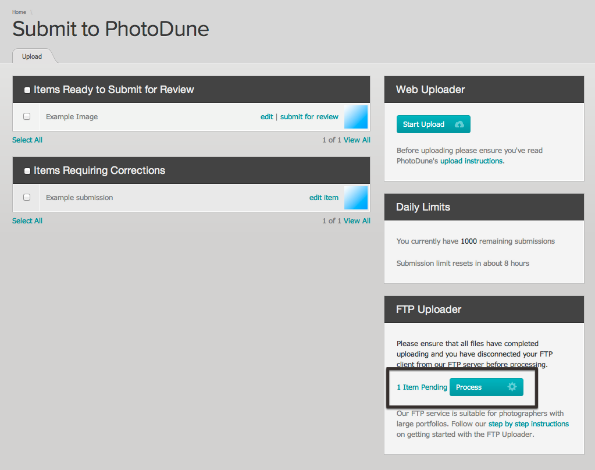 PhotoDune offers both web form and FTP upload. If you are uploading more than 5 images, we highly recommend using the FTP upload service. We recommend uploading in batches based on common release forms (eg. by photo shoot) so that the release forms attached are relevant to most or all of the images in the batch. All uploaded images are automatically linked to all the uploaded model releases. Please Note: Before uploading, ensure that your IPTC/XMP data is correct, as it will automatically be extracted to form the title, description and tags. 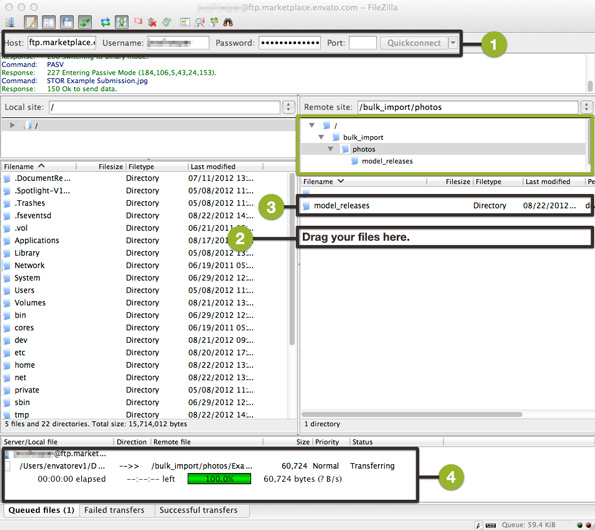 We recommend using the free FileZilla FTP client, although any FTP client will do. 2. Place your images in the /bulk_import/photos/ folder. 3. Place model or property release forms in /bulk_import/photos/model_releases/. These release forms will be automatically attached to each image in the FTP upload. Release forms should be .JPG, .PNG or .PDF format, and should not be zipped. 4. Wait for your files to process, and then close your FTP client. Navigate to your Envato Market Author Dashboard and click 'Upload'. Listed under the FTP Uploader window you should see "X Items Pending" which are now ready for processing (see screenshot below). Time for image processing varies depending on the number of images submitted and can take up to several hours for large portfolios. Once processed, images will be shown under one of two headings— Items Ready to Submit for Review, and Items Requiring Corrections. Select all your items that are ready to be submitted, and click 'Submit for Review'. Items that require corrections must be individually edited before they can be submitted for review.